Roller derby is a women's contact sport which traces it's roots back to the 1930's where it began as roller skating marathons. In the late 30's early 40's, two men, Leo Selzer and Damon Runyon begain shaping it into the sport that we all know and love today. Roller derby is a sport of speed, strength, and agility. It's athletes are the perfect marriage of grace and power. It's objective is simple; blockers enable the teams jammer to make her way through a pack of opposing blockers to score points. Players use their bodies as human wrecking balls, smashing into each other to either knock their opponents out of bounds or send them crashing to the floor. Northshore Roller Derby is a flat track league which means they play on a level track instead of the banked tracks of other leagues. For more complete description of the sport as well as rules and regulations, visit our Rules page! Quite simply put, Roller Derby is anyone and everyone and the Lethal Ladies are no exception. Derby does not discriminate against skin color, religion, or culture. They make their livings as accountants, clerks, police women, waitresses, and business owners who range in age from 18 to well into their 60's. The only requirement of a Derby Girl is when they step on the track they have to bring 100% and leave it all on the track when they are done, only that will do! The hard work and practice that is expected of Roller Derby players has to be piled onto the work of their everyday lives. A Derby Girl's life is filled with blood, sweat, and bruises. If you asked any player if it's worth it, they would probably smile and give you a whole hearted "Hell Yeah!" While traditionally a woman's sport, men inspired by Roller Derby find their places both on and off the track as well. They often find positions as announcers, coaches, officials, volunteers and some cities have men's leagues. The other thing that makes Roller Derby what it is, is the fans. When you walk into a match you will see the most diverse and beautiful collection of people in the world. Folks from every walk of live gather to throw themselves behind their favorite teams and players. 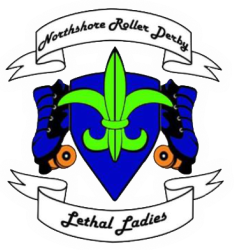 Northshore Roller Derby is a Federally recognized 501(c)(4) non-profit organization.